I tasted jackfruit for the first time a few weeks ago, after I bought a can of it to make a vegan version of “pulled pork” barbeque. After a few hours in the crockpot, the jackfruit looked exactly like pulled pork, which I then smothered in a barbeque sauce and ate on a puffy white bun. It was okay, I just wasn’t wowed. So I started to look for other ways to use jackfruit and was floored when I saw this lovely salad on foodgawker. I’ve never had Gỏi Mít Trộn (Vietnamese Young Jackfruit Salad), but was inspired to create a vegan version of it after seeing the photo and reading about the method and ingredients used to make it. I simply omitted the pork and shrimp, and used homemade vegan fish sauce, which I regularly make big batches of and freeze in ice cube trays, and then use as needed to make soups and satay sauce. This salad presents a nice balance of flavors and textures, and is perfect for enjoying during a warm day. Heat a tablespoon of vegetable oil over medium heat. Throw in the chilis and saute for about a minute. Then throw in the white part of the chopped scallions and saute for about two minutes. Throw in the sliced garlic and saute for another minute or two, making sure that the garlic does not burn. Now add in the jackfruit and the vegan fish sauce and saute for about two minutes more. Remove from the heat to cool. In another small saucepan, heat a few inches of vegetable oil over medium-high heat. After 5-7 minutes, your oil should be ready. Throw a shallot slice in—if it sizzles immediately, then throw the rest of the shallot slices in and fry for about 2-3 minutes. Remove with a skimmer and transfer to some paper towels to drain and cool. Wait until everything has cooled down before you assemble your salad. Toss together the jackfruit and shallots, then throw in the green parts of the scallions, as well as the mint and cilantro. 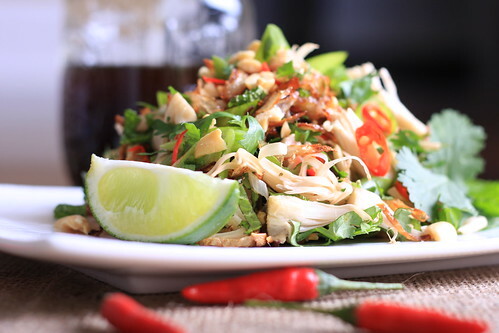 Serve the salad topped with the crushed peanuts and lime wedges. Add a little more vegan fish sauce if desired. Jackfruit always seems like it should be amazing but never really is. Maybe it would all be amazing if it wasn't canned. I haven't tried it in a salad though. Thanks for the idea! The plating is so lovely. I don't recall ever having jackfruit…. And I had no idea cooking it was required, what is the texture like? Thanks Angry Asian! I put it into the crockpot because I couldnt get it to break apart in its uncooked canned form. It gave it a silky, soft and break-apart texture. The further low bake made it a little "meatier" and chewier, although it was really subtle. Sounds so interesting. I have not yet delved into the jackfruit frenzy. My hubby hasn't had the best experiences when younger, with it, so have been putting it off. But think the time is soon! I just got back from 3 weeks in Vietnam and this is firmly on my to make list. Every time we ate it it was served with crunchy rice crackers for scooping. Thanks for the recipe! Okay, you convinced me to go buy a can and play with it as another meat substitute. Gorgeous photo, as always! I have made crab cakes with jack fruit and it was really good. I just used half of a crab cake packaged mix.